Mostly in the woods and pretty hilly. Signature hole is under an old bridge (1929). One of two courses on site. Baskets relocated from Camp Mad Anthony Wayne to Rotary Park. I-64; Exit 15 (29th St.), west on Rte. 60 to Rotary Park entrance. Follow park road to upper parking lot (stay to right past ball fields). 1st tee beyond and to the left of closed gate after upper parking lot. 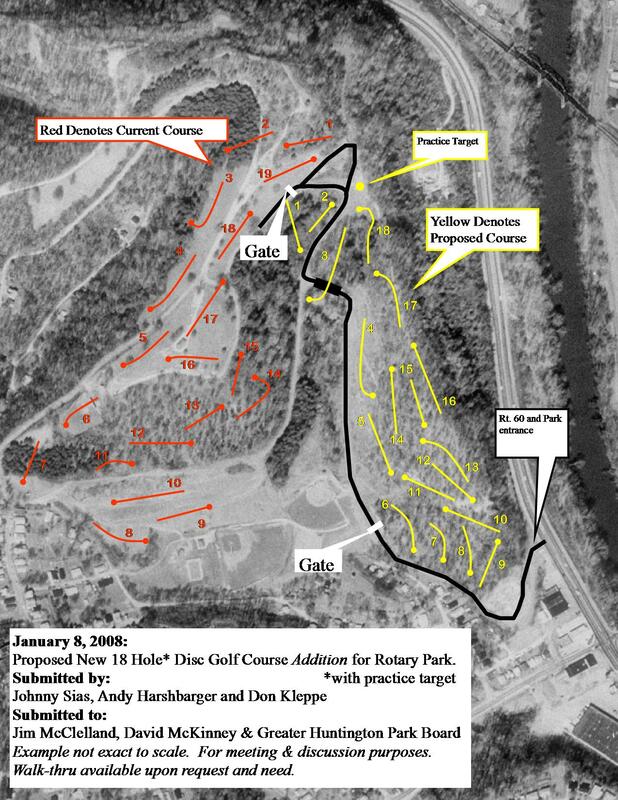 2 courses located at Rotary Park, this is the more difficult of the 2. All wooded holes, most are long with different widths for the fairways. Bring every throw you have practiced. indian rock is located at the same park as rotary park. this is really great if you want to spend the day golfing, as you can do two courses at the same place. indian rock is the more challenging of the two, and has a signature hole where you shoot thru an old bridge. very cool. if i remember correctly, indian rock is all wooded. there is a great view from the top of the mountain that is really beautiful.